Please join us on Sunday, June 3, 2018 at Settler’s Landing to celebrate Moncton’s early beginnings. For more details, please visit our event page. The Permanent Settlers Association honors the eight families, with such familiar names as: Copple, Jones, Lutes/Lutz, Ricker, Somers, Steeves, Trites and Wortman, who ventured to Canada in response to the promise of land grants to settle the Township of Monckton on June 3, 1766. 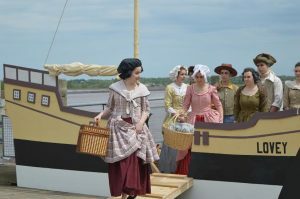 The wonderful re-enactment of the Landing on Friday, June 3, 2016, you see here, was followed by a reception at Moncton City Hall and a dinner in the evening at the Delta, Beausejour Hotel. This is the link to the video of the event at Settler’s Landing for those of you who were fortunate to attend and for those that couldn’t be there in person. (Satuday, July 30 – Monday, August 1) here / horaire en français ici.